The way we read the Bible often reveals how important we think we are. We put ourselves at the center of every story, focus on the text’s significance for our lives, and emphasize our responsibility. Yet, the Bible puts Jesus as the center of every story. The Biblical emphasis is on Christ not us. The contrast between these views is seen so clearly in the account of Peter walking on water, recorded in Matthew 14. Peter was always meant to sink, because only Jesus walks on water. The text is remarkable, and yet the way we often read it emphasizes Peter’s response. We read the passage and convince ourselves that we too can “walk on water” if we have enough faith. Now, there is certainly a lesson about faith that is present in this text, even Jesus highlights that when he rebukes the disciples. Yet, the point of the text overall is not Peter’s faith, but Jesus’ identity. The disciples themselves focus on the identity of Jesus in their response to his miraculous work in this passage. They worshiped him and said “Truly you are the Son of God.” His identity is the emphasis, Jesus walks on water because of who He is. He walks on water for the same reason that he can still the wind: as God, he has authority over nature. This is what we need to emphasize as we read the passage. Often we suggest that the point of the text is that if we keep our eyes fixed on Jesus then we can do anything. We emphasize the importance of our faith. The passage, however, is not a lesson in “how to walk on water.” It is a lesson on the person of Jesus. Peter did lack faith, but what did he lack faith in? The same thing that the disciples have lacked faith in across the narrative of Matthew: the true identity of Jesus. In Matthew chapter 8 we have the parallel account to this one in Matthew 14. There, in chapter 8, Jesus once again calms the storm and rebukes the disciples saying, “O you of little faith” (v. 26). The larger context of this account, however, finds several pericopes on faith in the person of Jesus. So, in verses 1-4 the leper sees and understands who Jesus is when he seeks healing. The centurion too understands in verses 5-13. Even the demons recognize who Jesus is, though of course they don’t worship him, in verses 28-34. Sandwiched between these accounts are two examples of those who do not believe rightly about Jesus. In verses 18-22 many others do not understand Jesus’ true identity and they fail to follow Jesus. Then lastly, the disciples fail to understand Jesus as he calms the storm in verses 23-27. The “little faith” has as much to do with who the disciples think Jesus is as it does with their trust in the midst of difficult circumstances. Peter was always meant to sink. Yes, he took his eyes off of Jesus and was overwhelmed by the waves and the wind. Yes, he had little faith, but not just little faith that he could walk on water. It was little faith in the person of Jesus Christ. Peter was always meant to sink because his sinking illustrated the uniqueness of Jesus. Jesus is the only one who walks on water. No one else ever tried it in the Biblical account, and no one else every did it in history. Peter’s sinking was a means of illustrating the uniqueness of the person of Christ and the importance of believing his identity. It wasn’t simply fear that kept Peter from walking on water. Only Jesus walks on water, it’s because of who he is. 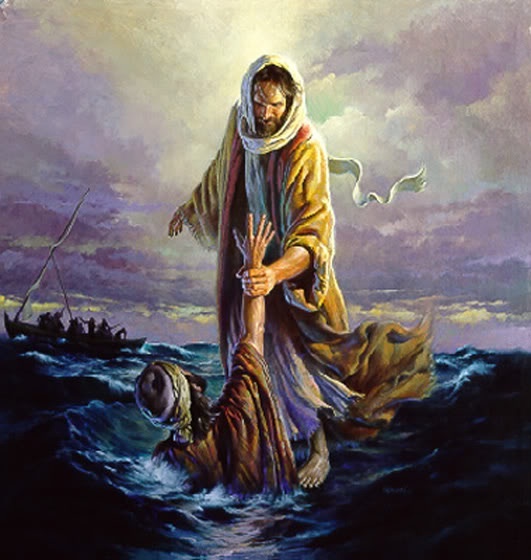 Peter was always meant to sink, but in his sinking he was grabbed up into the arms of Jesus His savior. We are all sinking beneath the waves. We can’t walk on water. No matter how strong our faith we can’t walk on water. We need to be scooped up into the arms of our savior. He alone can walk on water. He invites us to step out of the boat, “commands” us even, knowing that we will sink and yet knowing that in our sinking we can be saved. We are always going to sink, until we cry out to Jesus: Lord, save me.